The Marine Corps Martial Arts Program (MCMAP, /ˈmɪkmæp/) is a combat system developed by the United States Marine Corps to combine existing and new hand-to-hand and close quarters combat techniques with morale and team-building functions and instruction in the Warrior Ethos. The program, which began in 2001, trains Marines (and U.S. Navy personnel attached to Marine units) in unarmed combat, edged weapons, weapons of opportunity, and rifle and bayonet techniques. It also stresses mental and character development, including the responsible use of force, leadership, and teamwork. The MCMAP was officially created by Marine Corps Order 1500.54, published in 2002, as a "revolutionary step in the development of martial arts skills for Marines and replaces all other close-combat related systems preceding its introduction." MCMAP comes from an evolution dating back to the creation of the Marine Corps, beginning with the martial abilities of Marine boarding parties, who often had to rely on bayonet and cutlass techniques. During World War I these bayonet techniques were supplemented with unarmed combat techniques, which often proved useful in trench warfare. Between the world wars, Colonel Anthony J. Biddle began the creation of standardized bayonet and close combat techniques based on boxing, wrestling, savate and fencing. Also during this period, Captains Wallace M. Greene and Samuel B. Griffith learned Kung Fu techniques from Chinese American Marines and brought this knowledge to other Marines throughout the Marine Corps. In 1956, at Marine Corps Recruit Depot San Diego, Lieutenant Colonel Ralph Hayward (captain of the Judo team at MCRD) made Gunnery Sergeant Bill Miller the new Non-Commissioned Officer in Charge of Hand-To-Hand Combat. Miller was ordered to develop a new curriculum that a 110—or a 210—pound Marine could use to quickly kill the enemy. Miller created the program from various martial arts styles such as Okinawan karate, Judo, Tae Kwon Do, Wushu (often incorrectly called Kung Fu), Boxing, and Jujutsu. Every Marine recruit that went through MCRD was instructed in Miller's Combat Curriculum. This also included Special Operations Forces from all branches of the military and civilian entities. Later in 2001, retired Gunnery Sergeant Bill Miller was awarded the Black Belt Emeritus "for pioneering Martial Arts in the United States Marine Corps." Eventually these different techniques evolved into the LINE System in the early 1980s. Later, the system was found to be lacking in flexibility and techniques for use in situations that did not require lethal force, such as peacekeeping operations. The Marine Corps began searching for a more effective system. The result was the Marine Corps Close Combat training Program implemented in 1997–1999. MCMAP was implemented as part of a Commandant of the Marine Corps initiative in summer 2000. Commandant James L. Jones assigned Lieutenant Colonel George Bristol and Master Gunnery Sergeant Cardo Urso, with almost 70 years of martial arts experience between them, to establish the new MCMAP curriculum. In July 2011, MCMAP performers from San Diego demonstrated for the Koyamada Foundation's United States Martial Arts Festival at the Redondo Beach Performing Arts Center in Redondo Beach, California. Tan belt, the lowest color belt and conducted during entry level training, signifies the basic understanding of the mental, physical, and character disciplines. It is the minimum requirement of all Marines with a training time of 27.5 hours, and has no prerequisites. Recruits receive these belts after completion of a practical application test on all of the basic techniques of the Tan Belt. Gray belt is the second belt attained after 25 hours of training. It signifies an intermediate understanding of the basic disciplines. The Marine must complete the "Leading Marines" course from the Marine Corps Institute, and most instructors will require a report be completed on the Marine Raiders. Green belt is the third belt, requiring 25 hours of training. This belt signifies understanding of the intermediate fundamentals of the different disciplines. This is the first belt level in which one can become an instructor, which allows him or her to teach tan, grey, and green belt techniques with the power to award the appropriate belt. The prerequisites for this belt include a recommendation from reporting senior. Brown belt is the fourth belt level requiring 33 hours of training. It introduces Marines to the advanced fundamentals of each discipline. In addition, as with green belts, they may be certified as MAIs and teach tan through brown techniques. Prerequisites for this belt include recommendation of reporting senior. Black belt 1st degree is the highest belt color and requires 40 hours of supervised training. It signifies knowledge of the advanced fundamentals of the different disciplines. A 1st degree black belt instructor may teach fundamentals from tan to black belt and award the appropriate belt. In addition, a black belt can become an instructor-trainer, which authorizes them to teach and award all belts, as well as teach and certify instructors. Prerequisites include recommendation of reporting senior. There are an additional five degrees of black belt, with several of the same common prerequisites, including recommendation of reporting senior, appropriate level of PME completed, must be a current MAI or MAIT. Black belt 2nd degree to 6th degree signify that the holder is an authority in the Marine Corps Martial Arts Program. In addition to the above prerequisite, each belt also has its own rank requirements. Because the belts are worn with the Marine Corps Combat Utility Uniform, the complete range of belt colors such as red, yellow, or purple are excluded as a practical consideration. Once Marines obtain their green belt, they can attend an additional training course (such as those at the two Schools of Infantry) to become a martial arts instructor (secondary Military Occupational Specialty (MOS) 0916, formerly 8551). MCMAP instructors can train and certify other Marines up to their current belt level (though until November 2010 they could only certify Marines at one level below their current belt level). The instructor status is signified by one vertical tan stripe on the MCMAP belt. A Marine must have attended at least the Martial Arts Instructor (MAI) course to advance beyond first degree black belt. The only one who can train a Marine to be an instructor are black belt Martial Arts Instructor-Trainers (MAIT). An MAIT's status is signified by a vertical red stripe on the MCMAP belt and a secondary MOS of 0917 (formerly 8552). To become an MAIT, a Marine must have already completed a local MAI course. The Marine then attends the MAIT course at the Martial Arts Center of Excellence at located at Raider Hall aboard Marine Corps Base Quantico. MCMAP techniques can be taught to other services and to foreign military members, and belts awarded to those who complete the course. "MCMAP is a synergy of mental, character, and physical disciplines with application across the full spectrum of violence." The disciplines are the foundation of the MCMAP system, as it serves a dual purpose. MCMAP was implemented to increase the combat efficiency, as well as to increase the confidence and leadership abilities of Marines. As stated above, the three disciplines of MCMAP are mental, character, and physical. Marines are required to develop the mind, body and spirit simultaneously and equally. Safety is also of importance, so equipment such as mouthguards and pads are used in conjunction with techniques such as half-speed practice and break-falls to prevent injury. The Commandant of the Marine Corps has recently determined that the disciplines studied in MCMAP are integral to the function of Marines, and had ordered that all Marines will attain a tan belt qualification by the end of 2007. Additionally, all infantry Marines are required to attain a green belt qualification, and other combat arms must qualify for a gray belt by the end of 2008. Warrior Studies focus on individuals that have shown exemplary service on the battlefield, as well as discussion and analysis of combat citations. Martial Culture Studies focus on societies that produce warriors either primarily or exclusively. Some of the martial cultures that are studied are the Marine Raiders, Spartans, Zulu and Apache. By studying these cultures, Marines learn fundamental tactics and methods of the past and reconnect themselves with the warrior ethos of the Marine Corps. Combative Behavior studies interpersonal violence, as well as Rules of engagement and the Force Continuum (which dictates when and how much force can be used in response to the mission, up to and including lethal force). For some belts, PME courses are prerequisites. The development of this discipline also stresses situational awareness, tactical and strategic decision-making, and Operational Risk Management (ORM). The purpose of this discipline is to create "Ethical Warriors." It involves discussion on Marine Corps core values, ethics, and good citizenship. An instructor can fail a Marine if he or she feels that the student does not adequately possess honor, courage, and commitment. Some belts also require the approval of the commanding officer before being awarded. The force continuum is discussed, allowing a Marine to responsibly use the minimum amount of force necessary, including lethal force. Leadership qualities are also stressed. In MCMAP, only a third of the training involves techniques and physical development. The physical discipline includes the training of fighting techniques, strength, and endurance. This discipline also includes sustainment of skills and techniques already taught, in order to improve skill as well as develop weak-side proficiency. Ground fighting, grappling, pugil bouts, bayonet dummies, and other techniques are used to familiarize Marines with the application of the techniques used. In addition, physical strength and endurance are tested and improved with various techniques that often require teamwork or competition, such as calisthenics, running with full gear, log carries, and boxing matches. Techniques can also be practiced in water or in low-light conditions to simulate combat stress. MCMAP draws influences from several disciplines including Brazilian Jiu-Jitsu, Wrestling, Judo, Sambo, Boxing, Savate, Kickboxing, Isshin-ryū Karate, Muay Thai, Taekwondo, Kung Fu, Aikido, Hapkido, Eskrima, Sayoc Kali, Jujutsu, Krav Maga. Marines practice MCMAP after being exposed to Pepper spray. Marines practice ground fighting in the rain. Raider Hall, home of Marine Corps Martial Arts Center of Excellence. The techniques used by MCMAP vary in degrees of lethality, allowing the user to select the most appropriate (usually the least) amount of force. For example, a Marine facing a nonviolent but noncompliant subject can use an unarmed restraint to force compliance with minimal damage and pain. A more aggressive subject could be met with a choke, hold, or a strike. Lethal force can be used on a subject as a last resort. 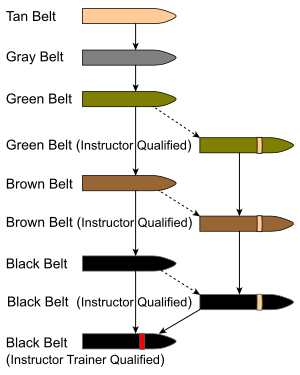 The majority of techniques can be defensive or offensive in use, with or without a weapon; allowing Marines flexibility in combat and operations other than war (such as civil control or humanitarian missions, as well as self-defense). An instructor can augment the circumstances of training to better fit the unit's mission, such as military police practicing after being exposed to pepper spray. Students must prove proficiency with 70% of 50 (35) techniques to pass and earn their belt. The tan belt syllabus is part of The Basic School and recruit training curriculum. ^ "@The Filme Files SHIN KOYAMADA'S INAUGURAL UNITED STATES MARTIAL ARTS FESTIVAL by Dr. Craig Reid". ^ "@US Martial Arts Festival 2011 Performers". ^ Flynn, LtGen George J. (18 November 2010). "MARADMIN 645/10: Announcement of Release of Marine Corps Order 1500.59 Marine Corps Martial Arts Program (MCMAP)". Deputy Commandant for Comabt Development and Integration. United States Marine Corps. Archived from the original on 29 June 2011. Retrieved 7 January 2011. ^ "MCMAP training inside and outside the Corps Black Belts Introduce Close Combat to Maldives". United States Marine Corps. Archived from the original on 15 October 2007. Retrieved 14 September 2007. ^ "MCMAP prepares Mongolians for future". United States Marine Corps. Archived from the original on 15 October 2007. Retrieved 14 September 2007. ^ Conway, James T. (16 July 2007). "ALMAR 034/07: Marine Corps Martial Arts Program (MCMAP) Update". United States Marine Corps. Archived from the original on 16 May 2008. Retrieved 14 September 2007. "MCO 1500.59: Marine Corps Martial Arts Program (MCMAP)". United States Marine Corps. 15 November 2010. Archived from the original on 20 January 2011. Retrieved 7 January 2011. "MCO 1500.54A: Marine Corps Martial Arts Program". United States Marine Corps. 16 December 2002. Archived from the original on 9 April 2008. Retrieved 26 June 2010. "MCRP 3-02B: Close Combat" (PDF). United States Marine Corps. 12 February 1999. Archived from the original (PDF) on 8 September 2008. Retrieved 26 June 2010. "MCO 1510.122A: Individual Training Standards (ITS) System for the Marine Corps Martial Arts Program". United States Marine Corps. 3 December 2002. Archived from the original on 9 April 2008. Retrieved 26 June 2010. "NAVMC 2933: MCMAP Training Log". United States Marine Corps. Archived from the original on 9 April 2008. Retrieved 26 June 2010. Corbin, Mack. "History of the Marine Corps Martial Art Program". Fight Times. Retrieved 26 June 2010. Figueroa, Joe A. (29 March 2001). "Guru's Teaching Inspired Commandant's Martial Arts Program". United States Marine Corps. Figueroa, Joe A. (29 March 2001). "Old Breed of Martial Artists Still Kicking". United States Marine Corps. Archived from the original on 29 June 2011. Retrieved 26 June 2010. Cerrone, Aaron (September 2003). "Real Fighting". Black Belt. Vol. 41 no. 9. pp. 88–92. Shusko, Joseph C. (February 2007). "The Ethical Warrior of the 21st Century". Marine Corps Gazette. Marine Corps Association: 20–23. Archived from the original on 10 November 2007. Hoban, Jack E. (September 2007). "The Ethical Marine Warrior". Marine Corps Gazette. Marine Corps Association: 36–43. Archived from the original on 23 October 2007. Hoban, Jack E. "Developing the Ethical Marine Warrior". Marine Corps Gazette. Marine Corps Association. Retrieved 26 June 2010. Taylor, Stuart (4 January 2002). "Marines' martial arts training aims to make the tough tougher". National Journal. Government Executive. Retrieved 26 June 2010. "The History of Marine Corps Martial Arts". Human Weapon. The History Channel. 21 September 2007. Archived from the original on 8 March 2010. Retrieved 26 June 2010. "Master Fights Marine Corps Martial Arts". Human Weapon. The History Channel. 21 September 2007. Archived from the original on 8 March 2010. Retrieved 26 June 2010. Jaffe, Greg (9 October 2000). "A Few Good Men Try the Marine Martial Art, and Take on 2 Gurus". The Wall Street Journal. Retrieved 26 June 2010. Wikimedia Commons has media related to Marine Corps Martial Arts Program. This page was last edited on 19 February 2019, at 23:38 (UTC).